Professor Dr Ingrid Mattson presently serves as Chair of the Islamic Studies Program at the Huron University College of The University of Western Ontario. She was previously the Director of the Macdonald Centre for Islamic Studies and Christian-Muslim Relations at Hartford Seminary in Hartford, Connecticut, where she was the founder of the Islamic Chaplaincy Program – the only accredited program to train Muslim chaplains in the United States. From 2006 to 2010 she served as the President of the Islamic Society of North America (ISNA), after serving two terms as Vice President – being the first woman elected to either position. 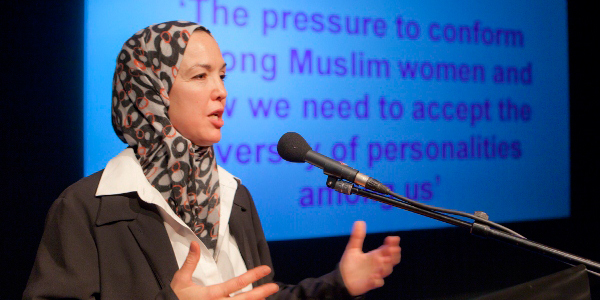 Dr Mattson was born in Canada and earned her PhD in Islamic Studies from the University of Chicago in 1999. Dr Mattson spoke to Al Nisa during the Symposium ‘Kent U Mij?’ (Do you know me?) in the Theater de Meervaart in Amsterdam on 22 September 2012, in between her keynote speech on conformity and diversity among Muslim women, and an open question-and-answer session with the audience. What makes a good Muslim leader? There’s leadership in so many different sectors. The first thing is that leaders have this inability to just let problems remain; they see a need and they need to respond to it, and so they do something. A good leader has the ability to analyse a situation, understand it, assess what resources are available, and then come up with a practical solution. A good leader is also looking to make him or herself replaceable, firstly by working on strengthening the institution in which he or she works (to extent that it’s appropriate and possible) and second, mentoring other people into leadership. Making sure that you have a strong organisation that could continue on without you, or that at least has the mechanisms for replacing you, and then personally mentoring or nurturing leaders. Do you think there’s a gender difference when it comes to leadership? There are generalisations, and they are not true in all situations. But I do think that women tend to be more consultative. They tend to try to convince people before going ahead, rather than simply making a decision and expecting everyone to go along. And that’s usually good. Although sometimes you do have to be decisive and you need to go ahead even if there isn’t buy-in. Part of leadership is knowing when to go ahead with a decision that’s within your authority because you’re really convinced it’s the right thing, even if other people don’t understand it at that point. Between that and taking the time to really get buy-in from others, there’s a balance. I think men tend to be more of one style and women the other, and you don’t want an imbalance between those two. While you were in ISNA, in which situations did you find yourself having more legitimacy or authority to speak on certain issues? I think a lot of people felt that the fact that I was in a position to speak for at least my organization ISNA, if not little more broadly for the American Muslim community. I think a lot of people found that beneficial after September 11th, because there was a great need to be able to explain Islam to Americans in terms that they understood. The fact that that’s my environment – I am Western and I’m Muslim – helped me to understand the concerns that were being raised. This helped with communication, which is natural, but it’s simply accidental that I was born in that environment. However, there is one disturbing aspect to it, because sometimes there is an implied racism. A friend of mine who’s a rabbi and a really a good friend of the Muslim community once said, ‘Ingrid, it was very good that you were the leader of ISNA when you were, because you’re this small white woman so you’re not frightening in a way that maybe your predecessors were.’ My predecessor and my successor were both dark-skinned Sudanese men. Is a man scarier than a woman? Is a dark-skinned person scarier than a white-skinned person? If you ask any of my students, they will tell you I’m much scarier than either of those two people. I thought that was really terrible; just seeing my face made people comfortable. I think Muslim men of colour are the most despised people now, as their faces are associated with intimidation or violence. That is really, really sad. How can female scholars achieve the legitimacy that male scholars do, even though they may have studied in the same places? That’s unfortunate. I think that kind of ignorance about women scholars in our still needs to be corrected. People tend to want to make sure that what they’re getting is authentic. I think the more we learn about our tradition, the more this kind of reaction will be avoided. There’s a lot of information certainly available now about women in the isnad, like Dr. Akram Nadwi’s book Muhaddithat: The Women Scholars in Islam. But there’s knowledge, and then there’s authority or influence. We have many women who have knowledge but if they’re not recognised by the community or given a position, then people may think that maybe they’re not really that qualified. I once talked with Shaykh Faraz Rabbani of Seeker’s Guidance from Canada. In his organisation there are many women who have studied in Jordan and have ijazah in different fields of Islamic studies. He was frustrated because not much was being done with the knowledge that these women have. I told him the reality is that until the mosque establishes official positions (whether paid or not) recognising her as a shaykha or as a religious teacher in the community, people won’t be going to her. Why would they recognise them as authoritative if the leadership of the community doesn’t? I think these two things are important: knowing our history to break up our inherited assumptions about religious authority, and establishing positions for these women. So it’s important for knowledgeable women to be affiliated to an organisation. But if the current leadership is dominantly male, how does a woman negotiate that? You have to find advocates. Allah (swt) says in the Qur’an that the believing men and women are awliya’ or partners of one another (9:71). Nothing can really happen in the community without partnership. Women need to call on their teachers, or those in positions of leadership who can advocate with them. It can’t always seem like only women are asking about this; this is about building the community together. There’s always going to be some people who resist it though. Either because they sincerely believe that men should be in authority, or, like all human beings, they don’t like to concede or share power with others. Or they’re just ignorant. But I’m sure there are some men who think this is wrong. You need to work in partnership with some men to change this. Some people can be worked on and others will remain intransigent. Sometimes you can work within the system and sometimes you need to build your own thing while your community lends legitimacy and support. Speaking of your own thing, I read that you have a dog. There are diverse opinions about it, so how do you deal with holding a minority opinion on an issue? Well, my opinion comes from one of the fiqh (legal jurisprudence) positions. The majority of fiqh positions consider the saliva of all dogs to be impure, but the Maliki school considers only the saliva of wild dogs to be impure. The Maliki position does not consider domestic dogs to be najis (impurity). There’s strong justification for it in the Maliki school from the argument that the Qur’an allows us to use hunting dogs, and even eating animals caught in their mouths, for example. So if you’re a Shafi’i or a Hanafi then you’re not going to be able to have a dog, and I’m not going to force anyone else to have one. But certainly, I very deliberately wrote about the Maliki position to raise the issue of the problem of making a religious issue of purity into a taboo, and then even a phobia. We have a big problem in North America, where we have many Muslim taxi drivers and are also blind and disabled people who use service dogs. These dogs help disabled people to move around in public spaces, but we Muslim cab drivers say things like ‘Dogs are haram’ and they will refuse to accept them disabled people with service dogs in their cab. This is just pure ignorance, because it’s not that dogs are haram, there’s nothing about putting a dog in a car. You’re not required to hate dogs. Your children leave najasa (impurity) all over, you’re not supposed to hate them right? I think it’s particular to Muslims in the West, although the widespread abuse of animals in Muslim countries is also haram. We really have to break this overreaction and confusion among Muslims. Like the issue of dogs, do you think there are other issues that Muslims tend to fixate upon and leaving more urgent issues undebated? Yes, very clearly. A former student of mine once told me how frustrating it was for her when she was homeless with three children. She was going to the mosque and even though people knew she was homeless, they were not coming to her – she had to come and ask for support. People would say ‘Well, we don’t have money for that’, yet money was being spent on all sorts of other things – fundraising for Muslims in other countries, or for certain improvements to the new building – when you have a homeless woman in the mosque. I’m sure there will be people who will come after us and say that we were blind to certain needs. It’s not that any of us are beyond that. We’re all human and we all have limited perspectives, but this is why you need to have wide consultation and a mechanism to include as many voices as possible. The more people you include in the decision-making process, the better chance you have of avoiding at least a gross error in neglecting a true need in the community. I’m working on a book that’s going to be called, tentatively, The Ethical Muslim. It gives tools for ethical thinking in Islam and provides case studies. I also have a new position in Canada as the new London and Windsor Community Chair in Islamic Studies at Huron University College at the University of Western Ontario in London, Canada. Like how I built that chaplaincy program at Hartford Seminary, I’m going to be looking to see what kind of religious leadership program would be suitable for Canadian Muslims in that environment, inshallah. That sounds exciting. Finally, any advice for Muslim women who work in the public sphere but who are not visibly Muslim? Wearing the hijab is just one part of being Muslim. More important is, are you bringing the character, behaviour, values and ethics of a Muslim to your workplace? Every Muslim should know the ethics of their field. If you are doing things correctly according to Islam and the civil law to the best that you can, you could even have an impact on your field, depending on how much authority you have. If you go to work and you’re doing things that contradict Islamic ethics or you don’t even know what the ethics of your field are – that’s problematic. It can be a touchy subject – you don’t want to make it seem like you’re bringing religion into the workplace, but you should have an attitude of responsiveness. That if people sincerely want information, that you are available to them. It may seem burdensome – why do you have to explain your religion when others don’t – but that’s the world we live in. Other minority groups have similar problems, so look at it as an opportunity. How many Muslims in the world have no chance to say anything? We are the elite in the Muslim world when it comes to educational opportunity and political freedom, so what kind of responsibilities do we have towards others? I don’t think you can just say you want to be a normal person. There are a lot of normal people (laughs). That’s all, thank you for your time Dr. Mattson.